Recently, I have been getting addicted to games like Harvest Moon and Animal Crossing again. So I have been pondering why I always tend to go back to these games once I get bored with others. Here's what I realized. I guess this is true even though I never noticed it, because it is something I do tons of in both Harvest Moon and Animal Crossing. Actually I think it is more of a I like the idea of fishing, cause I don't tend to be much of an outdoorsy person outside of being able to set up a tent and fire. Maybe this is why I keep coming back and performing the fishing activity in these games. Or maybe... it's just the cash I get after selling a full inventory of fish. I think this mainly goes with Harvest Moon. I spend a ton of resources on farming veggies, rather than buying tons of animals and trying to make money of milk, etc. This partly is true because in real life I do like plants, not flowers so much, but plants. So everyday in Harvest Moon I exhaust myself pulling turnips and then without taking a shower go and propose to the blacksmith to get declined and go back to the drawing board. Yet again, I think it is the money that motivates me in this game to grow tons of crops and sell them. In Animal Crossing I have spent a lot of time planting various fruit trees, but that is about all the growing I have done in the game. Cause I mean who wants to grow flowers everywhere? What can that get you? Nothing much, while growing fruit trees can bring in some good quantities of bells. This goes with both of the games. 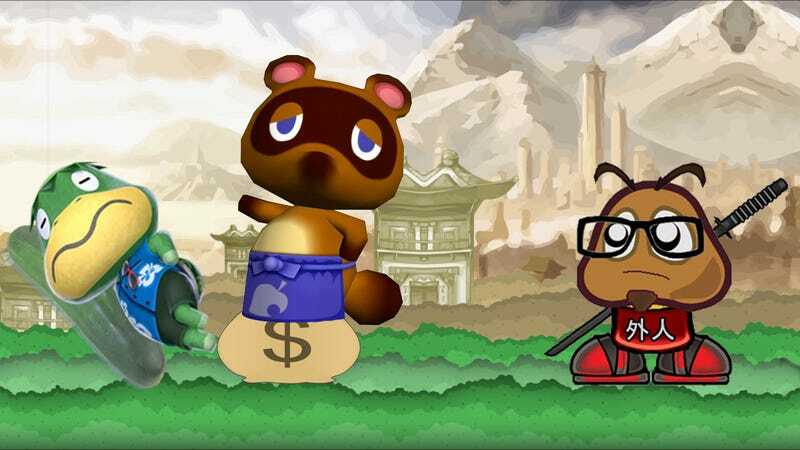 Animal Crossing upgrading your house costs oodles and oodles of cash. It can be quite disheartening to hear Mr. Nook say that your tiny basement upgrade is going to cost you half-a-million bells. But maybe it is also motivation to play the game more, so that you can achieve the goal of making a tiny basement for your house. But to do this, obviously you need to go fishing, or something else to make your money so that you can achieve the goal. So once again, money is key to the play in the game. In Harvest Moon: A New Beginning buying seeds and building materials and everything else can add up really quickly. Thus you must grow a lot, gather a lot, and love your animals so that they will give you milk a lot. All of this revolves around the monetary system in the game. It sure is nice to wake up in the morning and learn you've had 5000g deposited to your name from yesterday's shipment, but the happiness is cut short after you go and buy pretty much anything. Even if it is virtual money, I still feel very rewarded when earning it. Money is a great motivator for everyone, so what does this mean for a game where the game pretty much revolves around money? Maybe the game doesn't really revolve around money, but it is pretty hidden in the game so that you keep playing to build your town to the best it can be. So yeah, does money actually play some sort of hidden motivator in these games? Probably not, I'm just looking for a reason why these non-serious games keep drawing me back. It's probably more of I just want to relax than it is I want all of the money. But you know, I'll just roll around on the floor until the reason comes to me.